Suitable for a significant number of different uses, our 6×19 galvanised rope is often chosen by customers from different commercial backgrounds. Coming with a 7mm diameter, this fibre core rope allows for a degree of flexibility not found elsewhere. The perks of picking the 7mm edition of our 6×19 rope are various. It is still slender enough to allow for easy manipulation, yet sturdy enough to take on lifting tasks as well as other practical uses. It has a load capacity of just over 3 tonnes and a breaking force rating of 29.5kN, which is a testament to the resilience of its design. The galvanisation of the steel used to make this rope lends it an excellent level of rust-resistance. In situations that might lead to corrosion, such as outdoor use, this wire rope should not succumb to the effects of moisture. Galvanised rope like this is straightforward to adapt in a number of ways. Furthermore, by ordering with Rope Services Direct you can let experts handle the alterations rather than worrying about making them yourself. Choose from a range of fittings, order a unique assembly or ask us to make balustrades using this rope; the choice is yours. Give us the low down on what you need by calling 01384 78004 or dropping an email to the RSD sales team from our online form and you will enjoy friendly, experienced assistance. 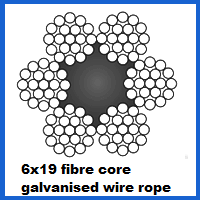 7mm 6x19 Galvanised Wire Rope Overall rating: 5 out of 5 based on 6 reviews.